The roots of today's Physics Department go back to the foundation of TUM in 1868. The successful development of research institutes and disciplines relied on the far-sightedness of individuals and the history of physics at TUM is characterized by many such personalities. 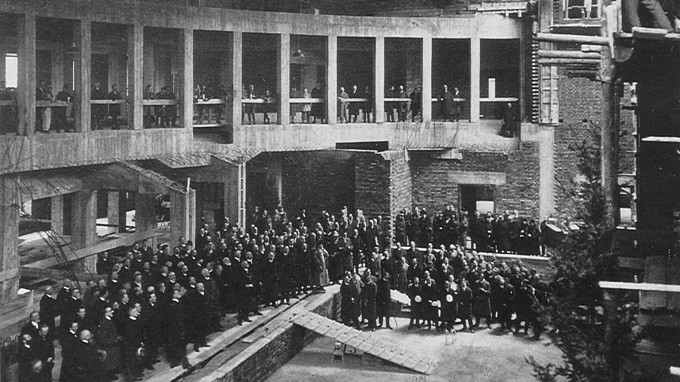 Celebration during construction of the new large experimental physics lecture hall in 1925. Photo: Historisches Archiv der TUM. The roots of today's Physics Department at the TUM go back to the foundation of the Polytechnische Schule München in 1868 whose name was changed to Technische Hochschule München (THM) in 1877 and finally to Technische Universität München (TUM) in 1970. Concomitant with its foundation in the year 1868 the Physikalische Institut was founded, originally called Physikalisches Cabinet. In parallel, technical physics has been a matter of particular concern since the early days and at the instigation of Carl von Linde (1842 - 1934), a major industrialist and honorary professor at the THM, the Laboratorium für Technische Physik was created in 1902. It was not until 1943 that an independent Institut für Theoretische Physik was also founded. These three institutes were finally combined and expanded into the Physik-Department in 1965, whose basic structure and organization is maintained up to today. The successful development of research institutes and disciplines depends on the far-sightedness of individuals and the history of physics at TUM is characterized by many such personalities. The first director of the Physikalisches Cabinet was Wilhelm von Beetz (1822 - 1886) between 1868 and 1886, an excellent teacher who wrote for example the well-known "Leitfaden der Physik". His successor was Leonhard Sohncke (1842 - 1897) who guided the institute between 1886 and 1897. He was a pioneer of the mathematical description of crystalline structures. The discovery of the concept of space groups by adding screw axis and glide planes to the 32 crystal classes is one example of his major achievements. It was originally his idea to set up a joint colloquium involving the physicists from THM and University of Munich ("Sohncke-Kolloquium"). The THM owes its particular tradition in physics teaching to Sohncke's successor, Hermann Ebert (1861 - 1913), head of the institute from 1898 until his death in 1913. He introduced for example experimental exercises as part of the education of physics and engineering students. His research work was predominantly devoted to geophysics and atmospheric electricity in particular. His experiments on cosmic radiation using free balloons may be considered as precursor of modern nuclear and astrophysics. Another important personality at that time was Robert Emden (1863 – 1940), associate professor since 1907 and member of the Bayerische Akademie der Wissenschaften from 1920 onwards. In 1933 he fled from the National Socialists to Switzerland. He worked scientifically in meteorology and his book on "Gaskugeln – Anwendungen der mechanischen Wärmetheorie auf kosmologische und meteorologische Probleme" (1907) became a classic in astrophysics. After the early death of Ebert, Jonathan Zenneck (1871 - 1959) became head of the institute from 1913 until 1936. His experimental work was devoted to wireless signal transmission, an area of research which he picked up earlier as an assistant to Ferdinand Braun in Straßburg. Apart from many scientific publications his pioneering work led also to various patents and applications. A second area of his research was related to the ionosphere. He is considered the father of ionospheric research in Germany giving it a center at the Herzogstand test station. He was early to recognize the importance of this young science for geophysics and astrophysics and organized a large network of ionospheric stations in Central Europe. Zenneck also had other far-sighted organisational talents. It was he who took the initiative to construct the famous large physics lecture hall at THM in the Arcisstraße, now called Carl-von-Linde Hörsaal, with seating for 860 students, at the time one of the largest in the whole of Germany. It is still in use for many different lectures and other events. Zenneck followed Oskar von Miller as chairman of the board of governors of the Deutsche Museum in 1933. Thanks to his seemingly neverending energy and enthusiasm, the museum was restored after the Second World War to its former splendour. Eventually, in 1939, a successor to Zenneck was found in Rudolf Tomaschek (1895 - 1966). He was an experimental physicist and known through his complete revision of Grimsehl's "Lehrbuch der Physik" (1929). In the field of geophysics his gravimetric work gave him international reputation. After the end of the Second World War in 1945 he was relieved of his office, and the Physikalische Institut had been almost completely destroyed. On September 1, 1946 Georg Joos (1894 - 1959) took over the institute as professor for experimental physics. He had been professor of Physics at the University of Göttingen until 1941, working both theoretically and experimentally and wrote for example the book "Theoretische Physik", a well known textbook which was used by generations of physicists as introduction to theoretical physics. From 1941 onwards he was leading physicist and scientific expert on the management board of Carl Zeiss in Jena, remaining in contact with the academic world by holding an honorary professorship in Jena. Between 1947 and 1949 he lived in the United States and later undertook to reconstruct the institute with much enthusiasm. His time in the U.S. had increased his awareness of the future role of physics at THM and it was he who set new directions by using his influence to appoint Heinz Maier-Leibnitz, a nuclear physicist as successor of Walther Meißner as director of the Institut für Technische Physik in 1952. Shortly before his death in 1959 he wrote the following words: "Today the pride and joy of the Technische Hochschule is the laboratory for technical physics that used to be entirely devoted to thermodynamics. There was not much of understanding when in 1952, a nuclear physicist was appointed as director of the institute on the suggestion of the physicists. This was the start of the process from which the Technische Hochschule München developed into a center of pure and applied nuclear physics. However, if one compares the physics in Munich, with three institutes and three full professors with that of American institutes, in terms of both equipment and staff, the ratio would be as bad as 1:10." It is unfortunate that Georg Joos did not live long enough to see the development of physics at THM in the 60's with the foundation of the Physik-Department in 1965 when the Physikalische Institut, the Institut für Technische Physik and the Institut für theoretische Physik were combined and the spectrum of activities broadened considerably. Walther Meißner. Photo: Historisches Archiv der TUM. The Institut für Technische Physik was founded in 1902. The priority given to technical physics has been a matter of particular concern since the foundation of the Polytechnische Schule. Many illustrious names accompany its history, names that culminate in Carl von Linde (1842 - 1934), who used his influence at the end of the 19th century to create the Laboratorium für Technische Physik. In collaboration with Walter von Dyck (1856 - 1934), professor for mathematics and at that time Rector of THM, he raised the necessary funding for this new laboratory. Von Linde insisted that the laboratory is headed by a young physicist, who would understand the technological needs of the laboratory and also guarantees excellent education of engineering students in physics and technology. The physicist Oscar Knoblauch (1862 - 1946) met von Linde's programmatic requirements. He was head of the institute for 32 years. The main focus of the work of Knoblauch and his team was naturally to master engineering challenges in connection with thermodynamics. This included for example Joule-Thomson-Effect, flow phenomena, heat transport or in short, the questions of practical thermodynamics related to the area of Linde's refrigeration technology and air-liquification. Other areas of applied research were focussed on sound protection and thermal insulation of buildings. Thanks to Knoblauch, a scientific environment was created which enabled engineering students to receive an excellent education in pure as well as ex-perimental and technical physics. It is no coincidence that Wilhelm Nusselt (1883 - 1957), one of Knoblauch's best students, became in charge of the institute of Theoretische Maschinenlehre as professor for thermodynamics from 1925 until 1952. Under very difficult circumstances, Walther Meißner (1882 - 1974) took over this institute in 1934. He is considered to be the father of lowtemperature physics in Germany. Upon Meißner's appointment he was already a famous scientist due to the discovery of the socalled Meißner-Ochsenfeld-Effect in 1933 (a magnetic field is always expelled from the interior of a superconducting material). During Meißner's directorship, the focus of the institute shifted more towards physics at lowest temperatures including the development of the necessary cooling and measurement principles. The Physikalisch-Technische Reichsanstalt in Berlin was destroyed during the war and the Bavarian government was forced to set up its own institute of this kind which was affiliated to the Institut of Technische Physik in 1946. 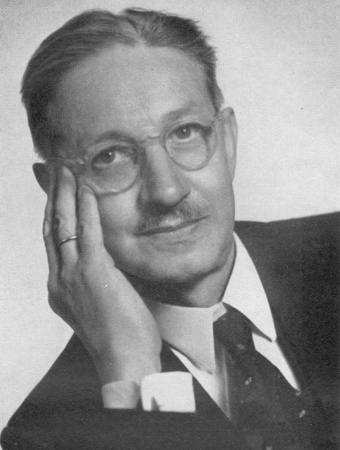 Walther Meißner was president of the Bayerische Akademie der Wissenschaften between 1946 and 1950. At his initiative the low-temperature physics division was separated and established as a new commission and institute of the Academy in Herrsching in 1946. The most important scientific result of this institute was the discovery of magnetic fluxoid quantization by Robert Doll (*1923) and Martin Näbauer (1910 - 1962) in 1961. This result was the essential experimental support for the new theory of superconductivity, the so-called BCS-theory. Meanwhile this institute became known as the Walther Meißner Institut and since 1966 it has been located at the Garching research campus in close proximity to the physics department. Its directors are also faculty members of the department. Heinz Maier-Leibnitz. Photo: Historisches Archiv der TUM. As mentioned already, Heinz Maier-Leibnitz (1911 - 2000), a nuclear physicist from university of Heidelberg, took over the Institut für Technische Physik in 1952, after the retirement of Walther Meißner. This completed the transition from the technical physics of the 19th century, when the main focus had been on thermodynamics, to the technical physics of the 20th century in which nuclear physics served as the technical basis for atomic energy, but also nuclear methods were used in many different areas, solid state physics in particular. Maier-Leibnitz took the initiative for the construction of a nuclear reactor with the vision to use neutrons as a versatile tool for multiple interdisciplinary research. The Forschungsreaktor München (FRM), popularly called Atomei or "atom-egg", because of its eggshaped roof, was built in 1956 in Garching in the north of Munich. It became operational in 1957 and was the seed for the development of the whole Garching research campus. The construction of this neutron source in Garching in such a short time was made possible by the fact that the interests of physics and politics met here in a very rare but fortunate circumstance. The scientific output was immediately very impressive and within only a few years many novel instruments and new measurement techniques were developed. The Garching Atomei became very soon an internationally well-known landmark in physics. The developed knowhow was exported to other initiatives for example to the construction of the European neutron source in Grenoble. The contributions and initiatives of Maier- Leibnitz were here essential as well, and from 1967 until 1972 he was the first director of the Grenoble high flux neutron source (ILL). Applied nuclear physics, especially its application to solid state physics became a highlight of research in Garching and was one of the few areas in natural sciences where the forefront was in Europe during those post-war years. It was also the far-sightedness of Maier-Leibnitz to realize that the physics at THM had to be reorganized and expanded which finally led to the foundation of the Physik-Department in the mid-sixties. A first major expansion of the scope was obtained with the appointment of Nikolaus Riehl (1901 - 1990), after coming back to Germany from the Soviet Union in 1955. He was a wellknown expert in the purification of uranium and contributed starting in 1957 to the construction of the FRM. In 1961 he became full professor for technical physics and concentrated his research activities on solid state physics, especially the physics of ice and optical spectroscopy of solids. The third institute from which the Physik-Department originated was the Institut für Theoretische Physik which was founded in 1943. Already a year prior Friedrich Sauter was appointed on a personal professorship, coming from Königsberg. Josef Lense (1890 - 1957) temporarily took over the institute at the end of the war until Gerhard Hettner (1892 - 1968) was appointed permanently in 1947. His area of research covered quantum statistics, thermodynamics, solid-state physics, molecular optics, magneto-hydrodynamics and theoretical plasma physics. When Wilhelm Brenig (*1930) succeeded Hettner in 1961, a second theoretical professorship was created for Wolfgang Wild (*1930, appointed also in 1961). Brenig was working mainly on theoretical solid state physics and Wild on theoretical nuclear and particle physics. Wolfgang Wild later became president of TUM and Bavarian minister of science and art. Rudolf L. Mößbauer. Photo: Historisches Archiv der TUM. 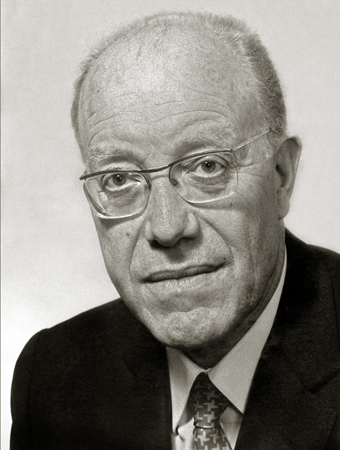 In the same year, 1961, Rudolf L. Mößbauer (*1929), a former student of Maier-Leibnitz at THM, received the Nobel Prize for his discovery of recoil-free emission and absorption of Gamma radiation in solids (Mößbauer Effect), which led to numerous applications in solid state physics, chemistry, biophysics, medicine and archeology. During this period Mößbauer worked at the California Institute of Technology in Pasadena. In order to bring him back to Munich, Maier-Leibnitz took the initiative and together with his colleagues the professors Brenig, Riehl and Wild he proposed in a memorandum in 1962 the establishment of a Physik- Department. Rudolf Mößbauer accepted the offer of the Bavarian Government to return from the U.S. in 1964 under the condition that the physics department be created. The Physik-Department was officially founded on January 1, 1965, replacing the three former independent institutes, but now with ten full professors with the necessary endorsement. In addition to Brenig (retired 1996), Maier-Leibnitz (retired 1979), Mößbauer (retired 1997), Riehl (retired 1969) and Wild (retired 1987), three further professorships were created in 1964. Wolfgang Kaiser (*1925, retired 1993) brought the new field of Laser physics and time resolved spectroscopy from the United States, Edgar Lüscher (1925 - 1990) widened the expertise in condensed matter physics until his sudden death in 1990, and Hans-Jörg Mang (*1931, retired 1992) was working in nuclear physics as theoretician. Klaus Dransfeld (*1926) and Paul Kienle (*1933, retired 1999) were appointed in 1965. They further expanded the scope of condensed matter physics as well as nuclear and elementary particle physics. Dransfeld left the Department in 1974 to become director at the Max-Planck-Institut für Festkörperforschung in Stuttgart and Grenoble. Following the foundation of the Physics Department, the scope of physics at TUM developed rapidly from nuclear solid state physics into nuclear, laser, condensed matter, and semiconductor physics. A new department building was constructed in the direct neighborhood of the FRM and most of the physics groups moved to Garching around 1970. Nuclear and particle physics received an additional push in 1968 with the appointments of Herbert Daniel (*1926, retired 1994) and Haruhiko Morinaga (*1923, retired 1991) and with the installation of the Tandem-Accelerator in 1970, a facility run jointly by the Ludwig-Maximilians-Universität and the TUM in Garching up to today. Solid state physics was strengthened by Michael Kalvius (*1933, appointed 1970, retired 2001) and Georg Alefeld (1933 - 1995, appointed 1971). Alefeld initiated the Bavarian Center for Applied Energy Science (ZAE) before his early death in 1995. In a similar way theoretical physics was expanded with Heinz Bilz (1926 -1986), appointed for a short time from 1969 until 1971 before he became director at the newly founded MPI für Festkörperforschung in Stuttgart, Hartwig Schmidt (*1935) who worked here from 1969 until 1978, after which he moved to the university of Hamburg, and Pierre C. Hohenberg (*1934), who joined the physics department in 1974 but returned to Bell Laboratories in 1977. The large Physics Department with relatively small groups turned out to be very flexible in reacting to new developments and subsequently various new directions were picked up during the past 30 years such as astro-particle physics, surface and interface physics, superconductivity, semiconductor physics, energy science and last but not least biophysics. This was made possible in part by finding appropriate successors after retirement or by splitting and expanding certain areas of research. Some of the colleagues who were appointed in the 70's and 80's are already retired as well. These are Wolfgang Gläser (*1933, appointed 1974, retired 2001) the "father" of the new neutron source FRM-II, Klaus Andres (*1934, appointed 1980, retired 1999) the director of the Walther- Meissner-Institut for low temperature physics, Hans-Joachim Körner (*1934, appointed 1974, retired 2002), whose main interest is in applied nuclear physics and Klaus Dietrich (*1934, appointed 1972, retired 2002) whose area of research is related to theoretical nuclear physics. The wide spectrum of scientific activities and the high international reputation of the Physics Department were only made possible by the many contributions of motivated scientists, directed by various assistant and associate professors. Among those is also Klaus von Klitzing (*1943), who was professor at the Department from 1980 shortly after his discovery of the Quantum Hall Effect, until 1984, when he took up a directorship at Max-Planck- Institut für Festkörperforschung in Stuttgart. Semiconductor physics experienced an additional push when von Klitzing received the Nobel Prize in 1985. The Walter Schottky Institut for basic and applied research in semiconductor physics (WSI) was founded as a central institute of TUM in 1987, based on proposals by Frederick Koch and Gerhard Abstreiter in 1985. It became operational in 1988, after a construction period of only 18 months, in close proximity to the Physics Department. Two of the three newly created professorships belong to physics, one to electrical engineering, bridging the gap between basic physics and semiconductor devices. 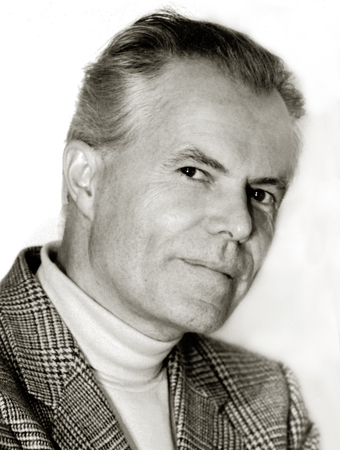 Erich Gornik (*1944) was appointed at WSI from 1988 until he moved to TU Vienna in 1992 as well as Günter Weimann (*1940) who left in 1995 to direct a Fraunhofer-Institut in Freiburg. In the 90's the physics department was further expanded by the constructions of Physik II, an extension of the Physics Department, the Bayerisches Zentrum für Angewandte Energieforschung (ZAE), and finally the new neutron source Forschungsreaktor München II (FRM-II) which is expected to become operational in the year 2003. The Atomei has stopped its nuclear operation in 2000 in order to get prepared for the new task at FRM- II. 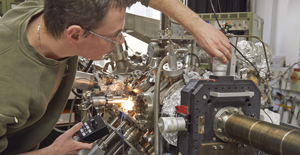 Various Max-Planck-Insitutes were founded in the neighborhood of the physics department during the past 40 years, dealing with plasma physics and fusion, astro and extraterrestrial physics as well as quantum optics. There were always close relations and collaborations between these institutes and physics at TUM. Together with these facilities, the Garching research campus has developed to one of the largest centers for pure and applied physics world-wide. In connection with the reformation of Universities (Hochschulreform) the Physik-Department was formally organized as Fakultät für Physik with three institutes in the 80's. The daily work in science and teaching, however, always incorporated the idea and the spirit of a Department. Furthermore, a reorganization into a department structure has taken place in 1997. Nowadays, the Physik-Department consists of 22 chairs and a total of about 35 to 40 professors. The history of physics at TUM is characterized by the fast development of physics in general, especially in the past fifty years. It can be proud of the high quality of teaching which is documented also by the many textbooks for physics and engineering physics written by members of the department and is also reflected by the recent Nobel Prizes for its former students Johann Deisenhofer (chemistry 1988), Erwin Neher (medicine 1991) and Wolfgang Ketterle (physics 2001). 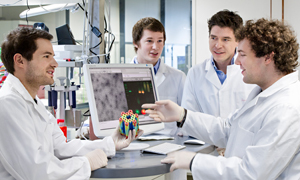 The prizes for chemistry and medicine demonstrate that interdisciplinary research is essential for many important achievements nowadays. Physics at TUM has been always characterized by its interaction and cooperation with other disciplines, also in the tradition of Carl von Linde, who realized early the importance of physics for the engineering sciences. The spatial separation, however, often made this interaction difficult in the past decades. The recent expansion of the Garching research campus hopefully will have a positive influence on future interdisciplinary research. Physics will be an important discipline in natural sciences in the 21st century as well, and will be essential for the future development and understanding of many problems. The Physik- Department of TUM is ready to master these challenges.